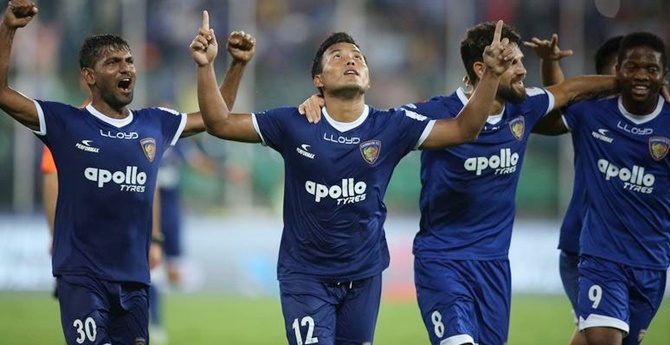 Chennaiyin FC outplayed FC Goa 3-0 with a dominant performance in the second leg of the Indian Super League (ISL) semifinal to advance to the final against Bengaluru FC on 4-1 aggregate, in Chennai, on Tuesday. Jeje Lalpheklua, who struck twice, was the star of the match as he scored in the 26th and 90th minutes to guide CFC into its second ISL final. The Chennai side had won the title in 2015. Local lad Dhanapal Ganesh found the back of the net with a superb header in the 29th minute to put the team 2-0 ahead at the Nehru Stadium. Chennaiyin now face Bengaluru FC at the grande finale on March 17 at Sree Kanteerava Stadium in Bangalore. Bengaluru FC had beaten FC Pune City on 3-1 aggregate in the other double leg semi-finals. FC Goa, with their backs to the wall after falling behind by two goals in the first half, tried hard but the home team's defence was equal to the task. The league's top-scorer Ferran Corominas and the speedy Hugo Boumous were kept in check as the CFC defence showed its versatility. Goalie Karanjit Singh has been a key member of the CFC side all season and he showed his utility with some superb saves. His effort to deny Lanzarote in the 86th minute was among them as he moved quickly to his right to palm away a superb freekick. He had also done very well to keep out a piledriver from Ahmed Jahouh in the 76th minute as the Goa players pushed ahead in search of goals. The first half saw the visiting side enjoying a lion's share of the possession (61 per cent to CFC's 39) but that mattered little as the hosts had scored twice. Like in the first leg, FC Goa had more possession but the Chennaiyin looked to mount attacks whenever they had the chance. CFC's defence has been good right through the tournament and rose to the occasion yet again. On a night when the Goa forwards threw everything at the opposition, the Chennaiyin back line kept things under control. It was an entertaining first half which saw Chennaiyin FC nose ahead in some style. Though FC Goa blazed away and created a lot of trouble for the Chennaiyin back line, some lazy defending let them down. The opening goal came against the run of play. Jeje, who had missed a clear chance just a few minutes ago, found the goal in the 26th minute. Gregory Nelson put in a brilliant ball from the left and found Jeje, who was unmarked. This time he made no mistake and beat the keeper Naveen Kumar, who was preferred over Laxmikant Kattimani. Three minutes later, Chennaiyin took control of the match as Dhanapal Ganesh found himself on the scoresheeet. The goal came about after another defensive lapse by FC Goa. Nelson put in another superb ball via a free kick from the left. It was aimed at the farpost where Ganesh rose majestically and headed it in. After a slow start, CFC began to gain more of the ball and had their first real chance when Francisco's attempted cross hit Narayan Das' arm in the 21st minute. Nelson's subsequent free kick found Jeje unmarked inside the area but the forward could not time his leap well and sent the header over the bar. The first leg had ended in a 1-1 draw at Fatorda on Saturday last. Can Dembele help Barcelona fill Neymar void?